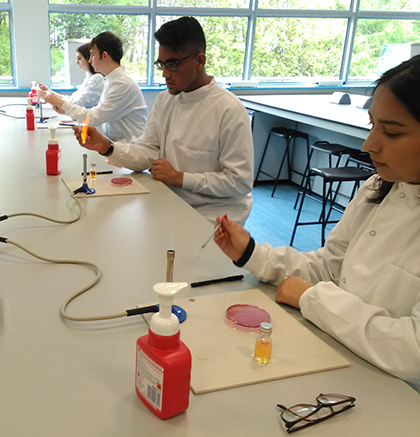 Budding doctors from The Sixth Form College, Solihull visited Keele University recently to complete laboratory practicals in their impressive facilities. Students from the College’s Pre-Medical School, which is a specialist enrichment offered to those students who have ambitions to study Medicine at university, went on the trip. It gave them the opportunity to use university-standard equipment and get a taste of undergraduate learning. The day built on a previous problem-based learning (PBL) scenario, focussing on cholera and infectious diseases. The students did a practical activity based around identification of different types of bacteria and followed this with an exercise requiring them to identify suitable antibiotics for a range of symptoms and infections. Over lunch, they had an opportunity to put questions to a current medical student and this was followed by an interactive session with a GP, who then went on to outline the role of the GP in the infectious disease scenario. Whilst at the Medical School, the students also experienced a hands-on anatomy class, based around the human digestive system. As well as a Pre-Medical School, the College offers a number of other specialist academies that are aimed at boosting students’ university chances in particularly competitive fields of study. They include an Engineering Academy, Law Academy, Psychology Research School and a Shakespeare Academy.